Let us put together a custom strap or net to provide safety and functionality to your customers. We have coated and uncoated webbing, and we can assemble various products to fit your custom needs. 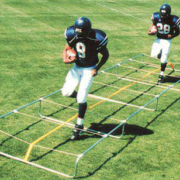 We can make large and small net assemblies that fit your requirements for sports, playground equipment, racing restraints, and air cargo. Whether the net is intended for safety, cradling, or any other variety of uses, you can trust us to provide a quality result. We have experience producing weapon slings and holster straps, typically made from nylon or polyester webbing and a variety of hardware. Printed polyester can create a truly custom look for military or sporting industries. If durability and cleanliness are your priorities, consider using coated webbing for your slings and straps. Nylon and polyester webbing have the potential to be stylish and functional pet accessories. For an easy-to-clean and smell resistant product, urethane coated collars create value for your customers. Hardware can be welded or riveted in place. Both coated and uncoated webbing can feature prints and designs. 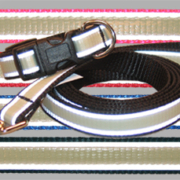 Ensure pet safety at night with reflective or glow-in-the-dark stripes. © Copyright - Masson Inc.